These are the instructions to install Cynogenmod 12.1 (lollipop) on Xiaomi Mi4 using the TWRP recovery. Note: The following method and files can also be used to install Cynogenmod 12.1 (lollipop) on Xiaomi Mi3 smartphone. Step 1: Download and install Xiaomi Mi4 usb driver on your computer. Step 2: Connect your Xiaomi Mi4 smartphone to the computer. Step 3: Download and install Minimal ADB and Fastboot tools on your computer. Step 4: Download TWRP recovery (v2.8.7.0 tested working) on your computer. 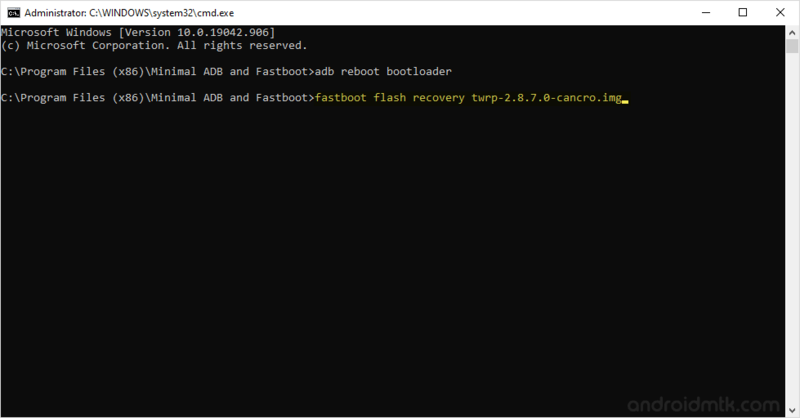 Step 5: Now, move the TWRP recovery file to the minimal ADB and Fastboot folder (i.e c:program filesminimal adb and fastboot). Step 6: Now, open py_cmd.exe or MAF32.exe from the Minimal ADB and Fastboot folder. The above command will boot your Xiaomi Mi4 smartphone into the flastboot mode (where you will be able to see the xiaomi fastboot logo). The above command will flash the twrp recovery on your smartphone. Step 9: Congratulations, you have successfully installed the TWRP recovery on your Xiaomi Mi4. Now, Lets boot into TWRP recovery mode: Being in the fastboot mode, Hold Volume Up and Power button until the “MI” logo appear on screen, then release all the buttons. Step 10: Now, You have successfully booted into TWRP recovery mode. Tap on the Wipe > Swipe to Factory Reset. Step 11: Now, download (link removed) latest cynogenmod firmware on your computer (latest firmware is always on the top of the list). Step 12: Now, move the Cynogenmod firmware to your Device (TWRP allows you to copy-paste files to the device in recovery mode). Step 13: Once you have successfully moved the Cynogenmod firmware on your device, Tap on the Install > Select the firmware file > Swipe to confirm flash. Step 14: Now, it will hardly take 2-5 minutes to complete the flashing process. Once, flashing process is completed, Tap on Restart > System. Congratulations, your Xiaomi Mi4 is now running on the latest Android firmware. [*] Always download the latest Cynogenmod firmware (you can find the latest built on the top of the list). [*] How to root: Move the flashable SuperSU to the phone SD memory > boot into twrp recovery > install > select the supersu file > swipe to install. [*] Credits: The Cynogenmod firmware shared on this page is created by Cynogenmod Inc. So, full credits goes to them for the firmware.